FREE Online Job Fair Coming Thursday, October 12th – Register Now! Published September 29, 2017 By Anna T. This post may contain affiliate links. Regardless, I only recommend sites I've researched and/or used and trust. This post was sponsored by Employment Options. Employment Options, an authorized Employment Network, is known for their national Online Job Fairs that feature leading work at home employers. 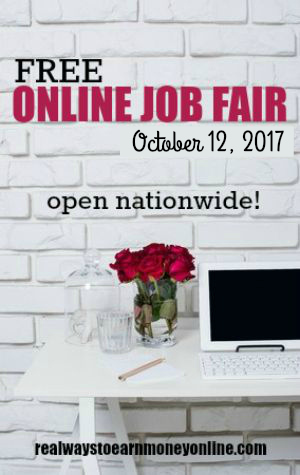 They have announced that their next free Online Job Fair will be on Thursday, October, 12th! The event is entirely online! Even though on a daily basis they primarily help people with disabilities who receive SSDI/SSI benefits, their free Online Job Fairs are open to anyone nationwide in the general public from any U.S. state. It is a great way to network online in chat rooms with leading, national work at home companies. Some employers with onsite jobs attend as well. Employment Options has been hosting these national Online Job Fairs for several years. Many qualified job seekers are hired on the spot the day of the event or a few days after. Many people ask “How Do I Find Legitimate Work at Home Jobs?” This is the perfect opportunity to learn about leaders in the Work at Home industry and meet their recruiters. The online job fair is chat based. You attend online and each employer will have their own public chat room that you can enter and ask questions while also observing as the recruiters discuss their company and job openings with other job seekers. The job fair hours on Oct 12th are from 10am to 4pm Eastern. However, job seekers can come and go as they are able on this day. Employer schedules will be made available ahead of time by email and also posted above each chat room on the job fair day. Don't miss this free opportunity! All you need is an internet connection and a computer.